Also Spring--I like the sunshine after the winter darkness, the pleasant temperatures, and the daffodils, tulips, crocus, and other spring flowers. My favorite scent changes. I've liked lilac, strawberry, honey, vanilla; generally the sweet scents. My current favorite is coconut. What is your favorite ice cream coping mechanism? My favorite coping mechanism used to be reading, but I prefer to read a book in one sitting and that hasn't been possible for quite some time. Also, I find it harder and harder to come back from pleasant book-world, where everything gets worked out in the few hours it takes me to read the book, to difficult reality, where so much is unstable and unknown. These days, I use crocheting for general sanity purposes, cross-stitching sometimes, and ice cream for the more severe occasions. What do you like to do in your free time moments? HA ha ha ha ha ha ha ha! *wiping tears of mirth that sprang to my eyes at the seemingly-impossible thought of having "free moments"* What was the question again? What do you not enjoy doing, and why, but have to do anyway? I DETEST planning dinner because, no matter what I do (SERIOUSLY! Even if I order pizza, at least one person will make a disparaging comment about which place I ordered it from!) at least one person, if not three or four, will complain about some aspect of the meal. I also detest trying to match the socks in the clean laundry. 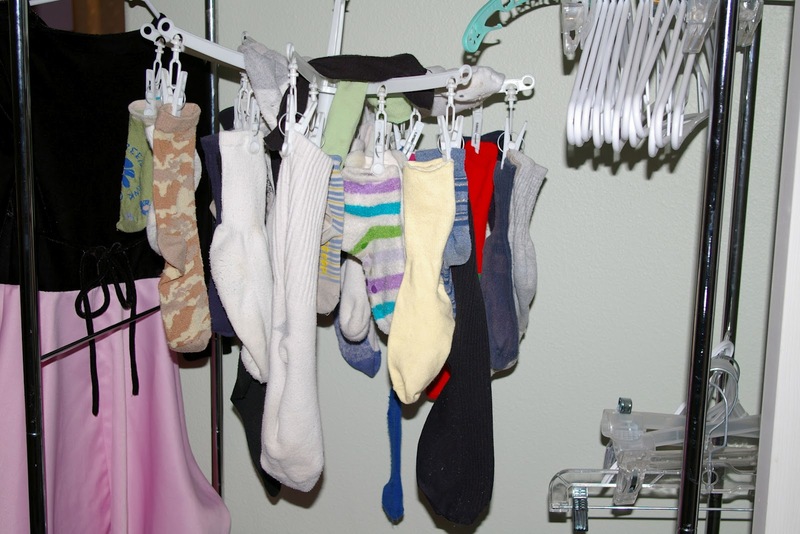 I have a laundry-hanging thing with 16 or so clips on it where I keep lone socks Now I have 2 awesome "Free Dobby" sock hangers, and they are ALWAYS full. I try to be careful and wise with money, but I am often SORELY tempted to throw/give away ALL OF THE SOCKS, and start over with the same kind of socks for each size. 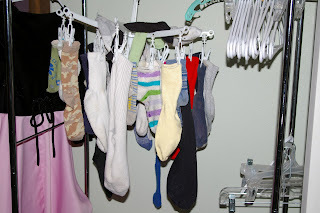 Lately there have been so many lone-socks, I've had to lay some across the top! If someone gave you money with the instruction that you had to spend it on something frivolous for yourself, what would you buy? Well, if I could get past the temptation to buy new socks for the entire family...I guess it would depend on how much money. If it was a MODERATE amount of money, I think I would like to have a supply of gift cards from various places (Amazon, Pizza Hut/Papa John's/Domino's, Joann's) to spend whenever I wanted! If it was a SMALL amount of money, I would buy as many fresh peas as I could find (YUMMY! ), yarn, CDP supplies (because it makes me happy to send someone a package full of CDPs! ), yarn, some of my favorite books in ebook format (I prefer actual books, but ebooks are more portable for vacation purposes), or yarn. What is the VERY! BEST! present you have ever received and why was it the best? My favorite presents have been those that showed that somebody cared enough to notice what I like/want without me having to say, "I would like you to get me _____." One example that comes to mind: The first night of our honeymoon, when we arrived at the Bed and Breakfast, at the foot of the bed, in the champagne bucket full of ice, was a carton of Ben and Jerry's Mint Chocolate Cookie; smart man =)! Ben and Jerry's mint choc chip ice cream in the ice bucket???? Oh, you are a very lucky, lucky girl. So glad you finally answered these!! I don't get the lone socks though. WHERE DO ALL THE MATES GO?? Is there a Bermuda Triangle of Socks? So funny, I hate the socks too. I am lucky now my girls can wear the same size socks, a little big on one a little tight on the other but oh we'll so I buy packs of the plain white socks and there are no color socks allowed. Sorry kiddos if you could act right and keep pairs together and not one under the bed you could have color socks. Hahaha, I have a sock graveyard on top of my dresser - all socks without a mate looking all lonely (and some of them, fairly dusty!) What THRILLS me is when one of my socks gets a hole in it and I have to throw it away, freeing it up to mate with one of the lonely socks! That is a good feeling! But most of the baby socks on there? I have a feeling they'll always be lonely :( So sad! Aww, I love that honeymoon story.